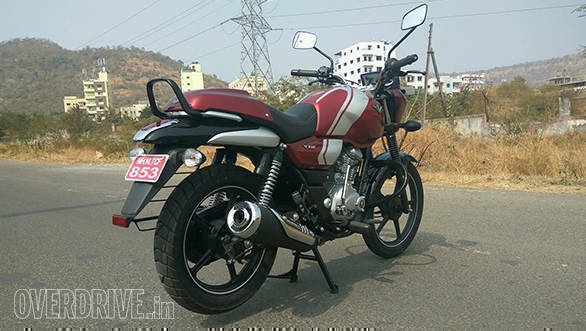 The Bajaj V12 was always in the pipeline, right from the time the V15 was conceptualised. For those who've been living under a rock, Bajaj's V line of motorcycles use the steel that was salvaged after the Indian Naval Ship (INS) Vikrant, India's first aircraft carrier was decommissioned and sent to the scrap yard. The Bajaj V12 commuter, gets a new 125cc motor and loses out on some equipment, but makes owning a piece of history even more affordable. So how different is it to the V15? We've always regarded the V15 as a bike that features a unique design and casting the V12 in the same mould gives it the ability to stand out among the current crop of 125cc machines in India. The tank looks substantial, and is easily one of the most eye catching elements on the bike. The side panels are similar to the V15, however, look closely and you'll notice that the stripe on the tank continues to the side panel, as opposed to the split type stripes on the V15. The bird's beak styled rear cowl remains as is on the V15 and is one of the most distinctive elements on the bike. Just like the rear panel, the front mudguard is also finished in black which is body coloured in case of the V15. The paint quality is brilliant and this new color scheme is exclusive to the V12. In addition you also get a black base, orange stripe colour scheme which again is new. Bajaj has been paying attention to quality over the years and the V12's fit and finish is right up there with Honda CB Shine. The V12 also gets new alloy wheels that are lighter than the V15's. You'll notice that the V12 gets conventional, 130mm diameter drum brakes on both wheels instead of a disc brake upfront. 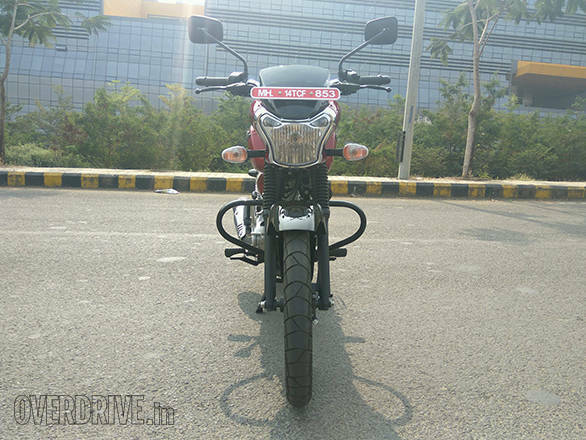 Bajaj says that it will be available at a later stage, but I wish it was available as an option right from the beginning. 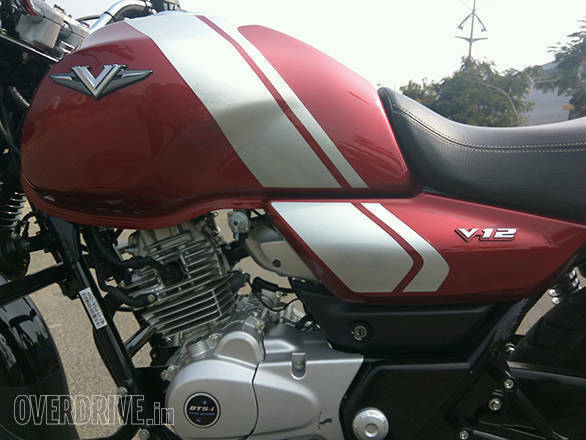 The V12's rivals like the Honda CB Shine and the new Hero Glamour get an optional disc brake. The front forks are thinner in diameter (30mm instead of 33mm on the V15) which is keeping in line with what the competition offers too. To keep costs low, Bajaj has also done away with the aluminum ring around the ignition slot and replaced it with a plastic one. The pillion footrest holder, (step holder in Bajaj speak) is also of the mild steel - tubular type instead of the aluminum units on the V15. The instrument panel on the V12 is borrowed from the V15 except for the digital fuel-bar type gauge that's replaced by an analogue fuel gauge. The only problem I had with the clocks were the tiny fonts that are hard to read when on the move. It's as if you're undergoing an eye test at an optometrist. Bajaj says that the V12's engine is all new and it's built using the know how from the 125cc motors you see in the Discover. The V12's air-cooled, single cylinder engine displaces 124.45cc and is BS-IV compliant. The stroke, at 58.6mm is identical to the V15 's motor and is in fact the longest in class. The motor produces 10.7PS at 7,500rpm and 11Nm at 5,500rpm. It's mated to a five - speed gearbox and the benefits of one more gear than the competition is evident at highway speeds, which I'll get to later. Since this is a commuter, the engine produces a major chunk of its torque in the low and mid-range. On the move, the bike felt pretty quick right from the word go. The engine revs quickly and the acceleration felt similar to the V15s. We'll have to test the bike to figure how close they really are in terms of 0-60kmph times. The torquey nature of the engine was also evident when I got myself stuck in the chaotic traffic heading towards Hinjewadi, Pune's IT hub. I was able to potter around in fifth gear at 40kmph without a sign of protest from the engine. And when the road opened up, all I had to do was simply roll on the throttle and the bike surged ahead. The bike can do this all day and that's keeping in line with what the usage pattern of most commuters is like. Fewer gear changes also makes it a pretty stress free to commute on. I must add that engine refinement is far ahead of the V15s. If you've read our V15 vs Honda CB Unicorn vs Hero Achiever comparo, you'll remember that the V15 lost one of its rubber footpegs, to the due to vibrations. In case of the V12, however, the vibes are thankfully far lesser. Yes, there is a wee buzz around the pegs and handlebars at speeds above 70kmph but before that it's pretty smooth. That said, the sweet spot lies between 60-70kmph, where I found next to no vibrations on our test bike. 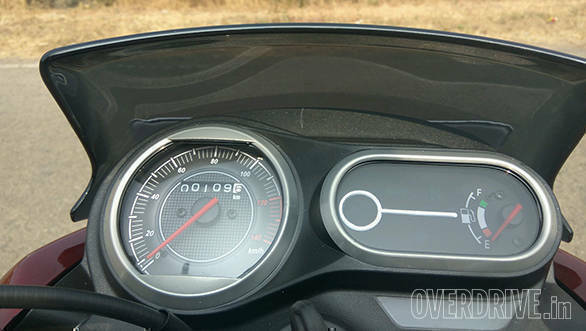 On the highway, the fifth gear allows for easy 80kmph cruising, which is not the case with bikes that have a four - speed gearbox, like the Honda CB Shine. On an empty stretch, I managed to see 95 kmph on the speedo but again, we'll wait for a full road test to ascertain the true top speed. The V12 uses the same chassis as seen in the V15. However the bike gets narrower, 2.75x18 tyres upfront and a 100/90 x 16 tyre at the rear. They are tube type and Bajaj says that tubeless tyres will be offered later on. From a safety point of view, I'd have preffered tubeless tyres. Unlike the V15's Ceats, the V12 uses MRF Kurve tyres which offered better feedback than the Ceats. The front forks, as mentioned before are also narrower, however, the rear shocks are similar to the V15's. 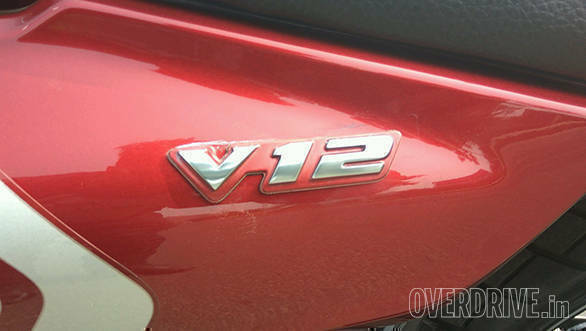 Bajaj has been listening to feedback from V15 customers and has setup the V12 to offer a plush ride. Riding over broken roads, I was surprised with the ride quality. The suspension does a splendid job of ironing out bumps and undulations and it's only the nasty potholes that get transmitted to the rider. Around corners the bike feels a tad overeager to turn - in which takes a bit to get used to. However, once you're past that, the bike feels pretty confident tipping into corners. 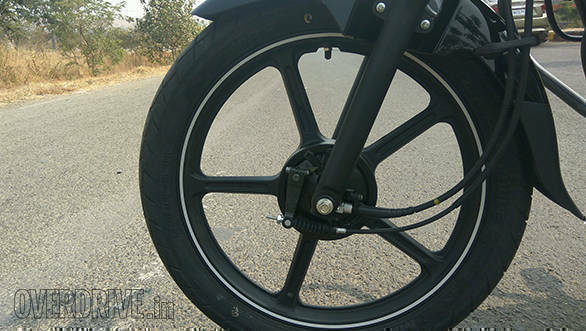 The drum brakes were adequate at best, however, there's no drum brake that can match the power of a disc brake and I'd wait for Bajaj to launch it before putting my money on the V12. The Bajaj V12 at Rs 56,283 (ex-Delhi) offers a unique proposition to the prospective 125cc buyer. It looks different, has a nice engine and the ride quality is what's expected of a bike in this class. The highway rideability is good too which is an added bonus incase you want to cover long distances on a 125cc bike. Yes the disc brake and Always Head Lamp On (AHO) feature will be available later on, but it's not a deal breaker. But the best bit about the buying a V motorcycle is owning a piece of history. That I feel is the V12's biggest draw.